This ocean front studio is a corner unit with direct beach and ocean front views from its large east window. The unit's large north window overlooks the pool and has beautiful northeast views of the beach and ocean. The unit is on the ground floor so you are approximately 7 steps to the pool and 15 steps steps to the beach. There is no need to carry bags up stairs or squeeze into cramped elevators during your stay. 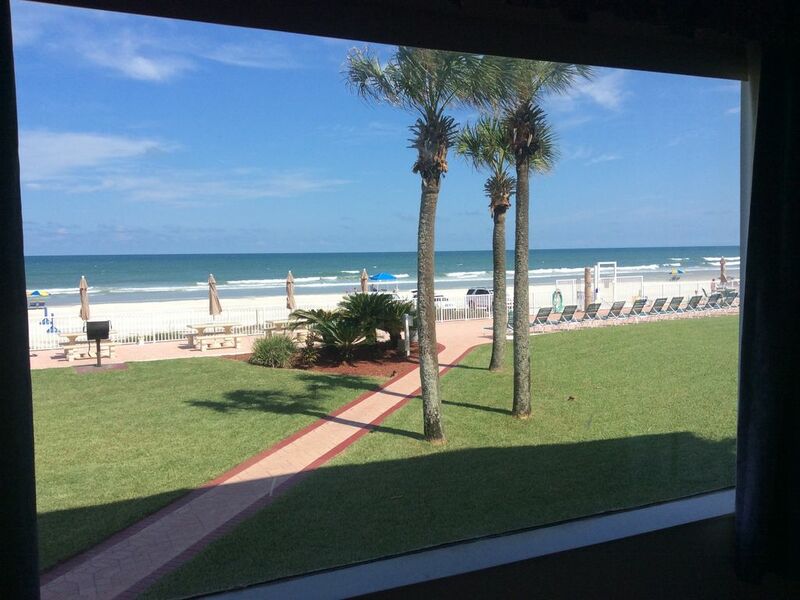 The unit has a private lanai for you to sit outside and relax while listening to the sounds of the beach. At night, you can rest in the unit's large king size bed. For your convenience, the unit is equipped with a refrigerator, coffee maker, microwave, toaster, plates and utensils. The Ocean Jewels property is beautifully manicured. The amenities include two large pools, kiddie pool, fitness center, barbecue grills and picnic tables overlooking the beach. The resort itself is just minutes walking distance to the Daytona Pier and Ocean Walk Shops and movie theatres. If you love the beach, you're going to love staying here. The view and balcony were amazing. It was so close to the festivities of Bike Week. My husband and I loved it! Room is exactly what is pictured , not fancy but just what you need , needs some updating inside the room but the property itself is very nice . As the last review said the light didn’t work and still does not only the small bedside lamp and light under microwave . Nice tv and porch area . We are already booked for another stay . Room was clean and fresh when we got there and I kept it that way . Good location . Met some nice older couples to chat with . Thank you to the owner for being honest about what we were getting and good communication . Enjoyed stay here however only complaint is overhead light was not working. Bought small battery light to place on table to eat by. Very neat place. Stayed here over new years 2019. Great fireworks viewed from patio of room. Jim A. Just what we expected. The room was clean and comfortable. The view was breathtaking each night as the full moon broke the horizon. Perfect for a getaway on a budget and away from a lot of people. Nice little restaurant right on the property for a great breakfast. We would come back in a heartbeat. The location on the beach was great. The room and building are a bit dated but looks like renovations are underway for this overall property. I would recommend for anyone that wants a great location and is watching there budget.Owner was very friendly and helpful throughout the process. This property is just as noted on VRBO so what you see is what it actually is. The views are amazing from both windows. The room is dated and could be spuced up just a bit. The bed was very comfortable. The only issue we had was with the keys. There are keys in the room that didn’t work on the doors so we were locked out for the night. The owner was very apologetic for the inconvenience that was caused to us. We would definitely stay here again. It may be a small place but who needs a big room when all you do is sleep there. We certainly enjoyed our stay.